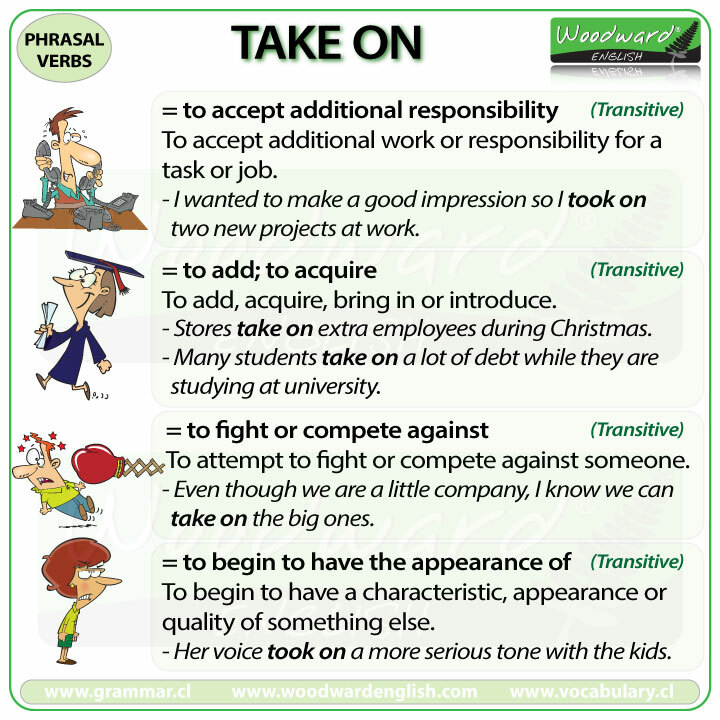 (transitive) to accept additional work or responsibility for a task or job. Synonyms are undertake and acquire. I wanted to make a good impression, so I took on a lot of tasks at work. I will take on the project if you don’t want to. I have taken on too much work. Can you please help me with this project? Shops often take on extra employees during the Christmas season. The boat was taking on water, so we had to plug the hole. The teacher has some spots in her classroom and can take on a few more students. Many students take on a lot of debt while they are studying at university. Even though we are a little company, I know we can take on the big ones. Do you want to take me on? Come on then! Her voice took on a more serious tone with the children. The doll took on a scary appearance in the dark.